Edgar McElroy was born on March 24, 1912, in Ennis, Texas. He enlisted in the Aviation Cadet Program of the U.S. Army Air Corps on November 28, 1940, and was commissioned a 2d Lt and awarded his pilot wings at Stockton Field, California, on July 12, 1941. His first assignment was as a B-25 Mitchell pilot with the 37th Bomb Squadron of the 17th Bomb Group at Pendleton Field, Oregon, from July 1941 until he was selected for the Doolittle Mission in February 1942. Lt McElroy was the Co-Pilot on the 13th B-25 to take off from the aircraft carrier USS Hornet (CV-8) on April 18, 1942, and after bombing enemy shipping and supplies at the Yokosuka Naval Base in Japan, the crew flew to China and bailed out when their aircraft ran out of fuel. After the raid he remained in the China-Burma-India Theater, and served as a ferry pilot with the Trans-India Ferry Command from May to September 1942. His next assignment was as a B-25 pilot with the 22nd Bomb Squadron of the 341st Bomb Group in India from September 1942 to March 1943, and he was then treated at hospitals in India, California, and Texas, from March to October 1943. Capt McElroy served as Assistant Operations Officer with the 47th Bomb Squadron at Randolph Field, Texas, from October to December 1943, followed by B-24 Liberator transition training from December 1943 to February 1944. His next assignment was as a B-24 instructor pilot and as Commandant of Students at Smyrna, Tennessee, from February to May 1944, and then as a B-29 Superfortress pilot with the 24th Bomb Squadron of the 6th Bomb Group at Grand Island Army Airfield, Nebraska, from May to November 1944. He then deployed with the 24th Bomb Squadron to North Field on Tinian in the Mariana Islands, where he flew B-29 combat missions against Japan from December 1944 to March 1945. Maj McElroy was treated at hospitals in Colorado and California from March to October 1945, and then served as Assistant Adjutant and then Squadron Commander of the 2518th Base Unit at Enid, Oklahoma, from October 1945 to May 1946. He served as Commander of the training school at Boca Raton Army Airfield, Florida, from May to June 1946, and was then treated at Walter Reed General Hospital in Washington, D.C., from June to July 1946. His next assignment was as Assistant Director of Supply and Maintenance and then as Base Shops Officer with the 2518th Base Unit at Enid from July to December 1946, followed by service as Aircraft Maintenance Officer with Squadron A at Williams Field, Arizona, from December 1946 to January 1947. Maj McElroy served as a flight instructor with the 2532nd Base Unit at Randolph Field, Texas, from January to July 1947, and then as a B-29 pilot and Assistant A-3 Officer with the 718th Bomb Squadron of the 28th Bomb Group at Rapid City Army Airfield, South Dakota, from July 1947 to April 1949. Lt Col McElroy next served as Base Operations Officer with the 28th Air Base Group at Rapid City AFB from April to September 1949, followed by service as an Operations Staff Officer and then Chief of the Flight Operations Branch with Headquarters Strategic Air Command at Offutt AFB, Nebraska, from September 1949 to September 1953. He served as Base Operations Officer and then as Commander of the 93rd Operations Squadron at Castle AFB, California, from September 1953 to April 1954, and then as Chief of Light Bomber Operations with the Combat Operations Division at Headquarters Fifth Air Force in Japan from April 1954 to February 1955. 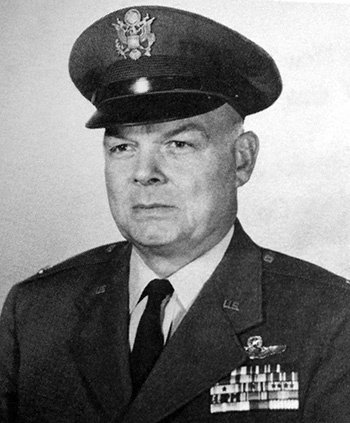 Lt Col McElroy next served as an Operations Staff Officer with the 1007th Air Intelligence Service Group at the Pentagon from February to October 1955, followed by service as Inspector Operations and Plans in the Operations Branch at Andrews AFB, Maryland, from October 1955 to June 1959. He served as Deputy Commander of the 1st Aeromedical Transport Group at Brooks AFB, Texas, from June 1959 to May 1960, and then as Commander of the Operations Squadron with the 6041st Air Base Group at Yokota AB, Japan, from May to December 1960. His final assignment was as Executive Officer with the 6102nd Air Base Group at Yokota AB from December 1960 until his retirement from the Air Force on July 1, 1962. Edgar McElroy died on April 4, 2003, and was buried at the Dallas-Fort Worth National Cemetery in Dallas, Texas. For extraordinary achievement while participating in a highly destructive raid on the Japanese mainland on April 18, 1942. Lieutenant McElroy volunteered for this mission knowing full well that the chances of survival were extremely remote, and executed his part in it with great skill and daring. This achievement reflects high credit on Lieutenant McElroy and the military service. 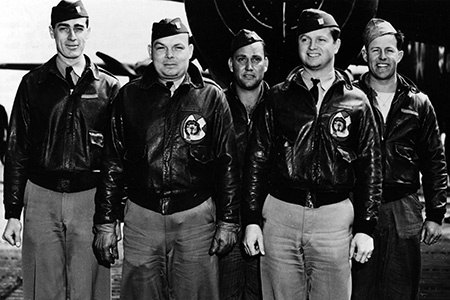 Crew 13 of the Doolittle Raiders, left to right-Lt Clayton J. Campbell, Lt Edgar E. McElroy, Sgt Adam R. Williams, Lt Richard A. Knobloch, Sgt Robert C. Bourgeois.